Given doctors often look in the mouth, the gag reflex is something that is encountered all too often. Suppressing it is even more important when testing or biopsy of an oral mass is required. But suppressing it can be a challenge. Interestingly, 1/3 of the human population lack a gag reflex. The gag reflex has both a physical as well as mental component. The physical gag reflex can be suppressed and will be discussed further here... However, the mental gag reflex (i.e., looking at vomit) may be so severe that only sedation can truly suppress it. In such sensitive individuals, merely looking at a tongue blade will trigger a gag. 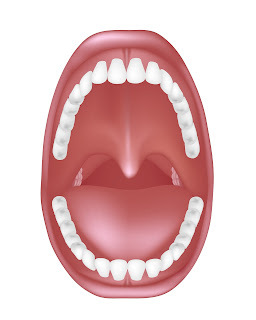 The gag or pharyngeal reflex is due to a reflex arc starting with a sensory stimulus and ends with muscle contraction. The sensory nerves responsible include principally cranial nerves 9 and 10 with possible contribution of 5. The anatomic areas innervated by these nerves include the tongue, palate, and pharynx. Perhaps the longest historical tradition of gag suppression comes from sword-swallowers who use a desensitization protocol that anybody can do. 1. Use a toothbrush or finger to identify where exactly in the mouth the gag reflex is triggered. Most people just move across the tongue towards the back. 2. Next, take a toothbrush and scrub that area for ten seconds or as long as you can before you feel that gag reflex being triggered. 3. Repeat step two as often as possible. The more the better. According to one sword swallower, perform at least a dozen times a day, seven days a week. This can be anything from a toothbrush to your finger. 4. As the gag reflex diminishes in a given location, start brushing further down the back of the tongue. Keep going until your gag reflex is suppressed to a satisfactory degree. 5. Maintenance... At this point, scrub the furthest point back daily, otherwise risk the gag reflex coming back. Another desensitization technique is to swallow without closing the mouth. This method involves swallowing with the teeth apart, the tip of the tongue placed anteriorly on the hard palate and keeping the lips relaxed. Dentures can also be made going from small to full-sized bases as the gag is desensitized. Given an office visit occurs in a far shorter time period than the days that desensitization requires, physicians typically employ numbing agents. Typically, such numbing agents are sprayed into the back of the mouth to deaden the nerves that trigger the sensory stimulus leading to a gag. More aggressive numbing can be accomplished by injecting anesthetics into the sides of the space between the hyoid bone and thyroid cartilage (superior laryngeal nerve block). Less invasive maneuvers that may be helpful to suppress the gag include acupressure/acupuncture. 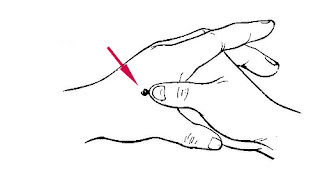 Light pressure is applied to Neiguan and Hegu points with a thumb and slowly increased to a heavy pressure until the patient feels soreness. Pressure should be applied for 5 to 20 minutes during which oral exam/procedure can be performed. 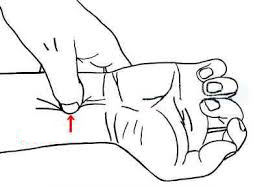 The Neiguan point (P6) is just past the middle of the right wrist on medial aspect (pinky side) where it dimples in. The Hegu point (LI4) is between the left thumb and finger. The Chengjian (REN-24) is in the groove midway between the lower lip and chin. In this location, pressure is applied for 5 minutes during which oral exam or procedure can be performed. Another technique is to make a fist over the thumb with the left hand which according to a 2008 study helps suppress the gag reflex. Nausea control by needling at acupuncture point Neiguan (PC6) during an intraoral impression-taking procedure. J Acupunct Meridian Stud. 2014 Dec;7(6):318-23. doi: 10.1016/j.jams.2014.04.009. Epub 2014 Jun 24.